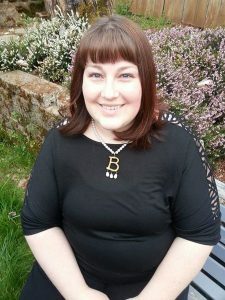 To commemorate the anniversary of the execution of Jane Boleyn, Lady Rochford, along with Queen Catherine Howard, and to celebrate the release of her latest novel, The Raven’s Widow: A Novel of Jane Boleyn, we have a guest article from the lovely Adrienne Dillard today. Welcome to the Anne Boleyn Files, Adrienne, it’s a real honour to have you here! When I wrote my first novel, Cor Rotto: A Novel of Catherine Carey, I felt like I had a bit of a disadvantage. Though I could read any number of first-hand descriptions of the locations where my story took place; nothing could come close to experiencing it first-hand. Sure there were plenty of photographs available to me, but those only told half of the story. I needed to stand in those places to get a true sense of them. What did they smell like? What was the view like? Could I hear the rushing of the Thames or just see it? Was the room cosy and bright or chilly and damp? As I wrote that first novel, I had to trust my instincts and make scientific guesses, but with my second one, I wanted everything to be just right. During the last week of September 2016, my dream to place my own feet in the footsteps of Jane Boleyn, Lady Rochford, finally came true. I set off from my home in the Pacific Northwest, USA, bright and early on a Thursday morning and by Saturday I was walking through the alabaster walls of that mighty fortress, the Tower of London. I really had no idea what to expect as I ambled past the ticket booths, snaking my way through the throng of tourists, but I knew without a doubt that I was in for a treat. I should also mention that I was accompanied on this first visit to the Tower with a group of wonderful authors and historians from MadeGlobal Publishing! Not only did I get to see these amazing sights first-hand, but I also had a bounty of historical knowledge right there at my fingertips. 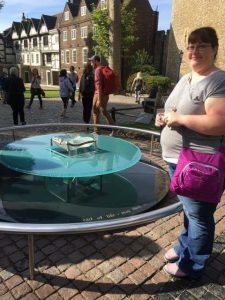 You haven’t lived until you’ve seen the place where Anne Boleyn was executed with the Queen of Anne Boleyn knowledge, Claire Ridgway, herself! I kept pinching myself to make sure I wasn’t dreaming. There was so much to see and experience at the Tower; I ended up returning for one last visit at the end of the week just before I headed back home. I could go on and on about all the fascinating things I saw during those two days at the place where Jane Boleyn spent her last days, but I’m going to narrow it down to the one thing that left the most lasting impression. There is only one way to get into the chapel, and that’s by going on one of the guided tours hosted by a warder. You know, those guys more commonly called Beefeaters? I had been warned that they had a flair for the dramatic, so I was unsurprised when our warder launched into the gruesome details of the murder of Queen Anne Boleyn. However, I failed to contain my disgust when he informed the hushed crowd that the queen had been charged with witchcraft. “NO! I shouted indignantly. Thankfully, no one was paying attention to the obnoxious American tourist near the memorial. They were all too enraptured with the gore spilling from the guide’s lips. I tried to tune out the noise for my own sanity and focused, instead, on the beautiful sculpture before me. I knew that the location was wrong. The real scaffold stood a few yards away, in front of where the Waterloo Barracks now stand, but that didn’t take away from the experience. As I stared down at the glass pillow and the table surrounding it, I felt a catch in my throat. It took a moment for the gravity of it all to settle upon me, but when it did, I had to blink back the tears pricking behind my eyes. There are several names on the memorial, but only three of them held my gaze: Queen Anne Boleyn, Queen Katherine Howard and Jane Boleyn, Viscountess Rochford. I turned to see my companion, Beth von Staats, of Queen Anne Boleyn Historical Writers (queenanneboleyn.com), fighting back her own tears. We stood together quietly, admiring the artist’s handiwork while contemplating the tragedies he sought to honour. Before too long, the warder’s spiel was finished and we were finally allowed to shuffle into the chapel where all three women had been laid to rest. My anticipation was so great that I found it hard to breathe as I descended the few steps leading into the entrance. Knowing I would write a scene that would take place in this very room, I wanted to soak in all I could. I was terrified that something would slip my notice. I took my time walking down the aisle, my eyes drinking in the beauty of my surroundings. I found no pews, only simple wooden chairs, so I took the first one in the front row, nearest to the chancel. You can’t approach the graves of the executed, so I had to make do. 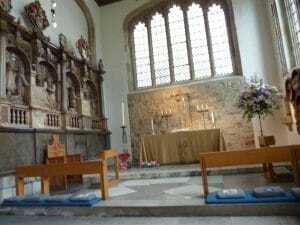 Turns out that I had great taste because, on my second visit to the chapel later that week, the warder told us all that Her Majesty, Queen Elizabeth II, sat in the very same chair on her last visit to the chapel. Colour me chuffed! I found out later that what the warder said about George’s grave was wrong. The best guesses actually place him much deeper into the chapel, closer to his sister. But the effect of his words remained. For a few brief moments, I was standing in the same space occupied by the earthly remains of people I had I studied and loved for so long. The tour was wrapped up all too quickly and before long we were being hustled out of the chapel. I dawdled for as long as I could and then paused one last time just inside the doorway to read the metal plaque gracing the wall. Underneath the ornate heading “Buried in This Chapel” is a list. I found George Boleyn and Queen Anne Boleyn at the top next to the year 1536, but when I searched down the list to the year 1542, I saw that it went to 1549 just after Queen Katherine Howard’s name. “Excuse me, why isn’t Jane Boleyn’s name on this list?” I dared to ask the warder standing at attention, patiently waiting for me to make my exit. “Oh she wasn’t considered notable enough to be listed,” he replied with a dismissive wave. My heart fell. How could Jane not be notable enough to make the list? Katherine Howard may have been the second queen to be executed, but Jane was the first maid to follow her mistress to the scaffold. She came from a good family with strong ties to the nobility and served all, but one of the king’s wives. The eighth Henry changed the laws of the kingdom to execute her for goodness sake! From that moment on, no one was safe, regardless of their mental stability. The warder’s words reminded me of why I set out to write The Raven’s Widow in the first place, and noting the absence of George’s name on the Tower Hill scaffold memorial a few hours later as we walked back to the tube station hammered the point home. Over time, the truth of their lives has been distorted; their reputations maligned. Their voices have been stolen, but maybe it’s not too late. We can find them again if we look hard enough. Adrienne Dillard, is a graduate with a Bachelor of Arts in Liberal Studies with emphasis in History from Montana State University-Northern. She has been an eager student of history for most of her life and has completed in-depth research on the American Revolutionary War time period in American History and the history and sinking of the Titanic. Her senior university capstone paper was on the discrepancies in passenger lists on the ill-fated liner and Adrienne was able to work with Philip Hind of Encyclopedia Titanica for much of her research on that subject. Her previous works include best-selling novel,“Cor Rotto: A Novel of Catherine Carey” and “Catherine Carey in a Nutshell” for MadeGlobal’s History in a Nutshell series. Her newest novel, The Raven’s Widow was released in February 2017. When she isn’t writing, Adrienne works as an administrative assistant in the financial services industry and enjoys spending time with her husband, Kyle, and son, Logan, at their home in the Pacific Northwest. 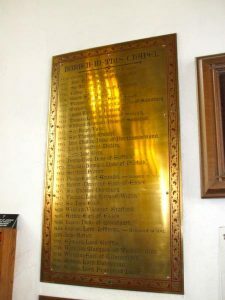 Pictures: Photo of Adrienne Dillard at the memorial c. Adrienne Dillard; Photo of interior of the Chapel of St Peter ad Vincula and burial list c. Paudie Kennelly. 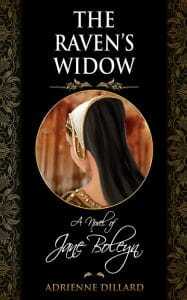 Hello, Adrienne, loving your new book and articles, very interesting to follow Jane and Katherine and the Boleyn family. I have only been on the tour once at the Tower and I think they have used the same, unrevised script for years. It’s sad Jane is not on the list. Everyone there should be. What has how notable you were to do with remembrance? If someone was executed or buried there they deserve to be remembered. I have a book on the footsteps of Anne Boleyn. Perhaps you may write the footsteps of Jane Boleyn or Catherine Carey one day? Thank you so much Banditqueen! It was certainly a very touching and emotional experience to see where Jane took her final breaths. I was extremely disappointed not to see Jane on the brass memorial, but it was an excellent reminder of why I set out to write about a her. I truly hope that I’ve done her memory justice. Hi Adrienne, I pre-ordered your book in the Kindle Edition and had the email from Amazon this morning to say that it would be delivered to my iPad. Looking forward to getting stuck into it tonight, curled up by the fire with the cat. Poor Jane Boleyn, I agree with Banditqueen. I really appreciate your posting and the detailed quite candid,account of your visit to the Tower and in the St.Peter ad Vincula chapel. I hope that I will get to experience it one day. I can relate to your feelings and the fact that you just couldn’t hold back when the Beef Eaters when on and on about the gruesome details of executions and Anne’s charge of witchcraft. i don’t like the fact that they sensationalize the deaths of these most unfortunate people who had to die that horrific death. I don’t like how the guards carry on about it that way. And i have been told (quite rightly by my husband) that i would get in a big argument with them! But even so i hope I get the chance some day. What a feeling it must be to be so close to the people who i have such a fascination and sympathy for, no doubt i would get emotional. Thank you,for your article,Adrienne. It really was a wonderful experience…Beefeater stories aside, LOL. It’s such an incredible feeling to be so close to their remains. I hope that you are able to visit one day 🙂 I think it will be a life changing experience for you! The Wardens do change their tour stories – it often comes down to which warden you get. I am lucky enough to attend them fairly regularly. They obviously sensationalise their ‘stories’ to appeal to a wider audience. You only have to look at the success of the London Dungeons. They often have inaccuracies. It keeps the tourists happy, and tourists keeps the Tower going. It’s my understanding those mentioned on the brass plaque are the bones of those identified in Victorian times, which obviously could be dubious. They were obviously a bit lax on your particular visit, as photos are forbidden. It is a deeply moving chapel to visit. I’m so jealous you get to go so often! I went twice and I still don’t think it was enough 🙂 I can’t wait to go again. Rest assured, only the first photo is mine. I was not allowed to take any photos inside the chapel. Luckily, there are some images online so you can see a few that way. I had two different guides on the two different days I went. Happily, the second warder didn’t repeat the witchcraft charge, but most of the rest of his spiel was like the first one. He didn’t seem to relish as much in the gory details either. It really does depend on which warder you get. Regardless, it was a wonderful experience and I highly recommend it! A few years ago, they tried letting the public enter the chapel unsupervised – and this was stopped because people were stealing from the chapel. Hence you can on,y enter on a Yeoman Warder’s tour. If you’re going planning on visiting, it’s best to check there are no events, such as weddings, going on. I might be mistaken, but one of the last names on the brass plaque is that of Thomas Overbury, who was poisoned in the Tower – his date is given at around 1613, I think. The execution site is a memorial to all those who died on Tower Green – but keep in mind it is a memorial and those commemorated did not die on that exact spot. Hi, I have lived in London for many years and have visited the Tower on many occasions . It’s very interesting to here your take on the “wardens ” at the tower. Hi I went to Erwarton Church today in Suffolk where Anne Boleyn’s heart is said to be buried. It was very sad as the church is suffering badly from damp. It is reported that they are attempting to raise funds as some one has stolen the lead from the roof. Isn’t there something that fans oif Anne Boleyn’s can do to help the Church?